Dr. Syntax: Wikipedia and "Open-Source History"
I have resented the way Wikipedia is disdained and often not considered a proper reference for serious articles. The 1911 Encyclopaedia Brittanica is fine, but the 2010 Wikipedia is not! Much as I value Wikipedia, I would be uncomfortable using it as a reference for "serious articles," or at least as my only reference. The post above suggests why. 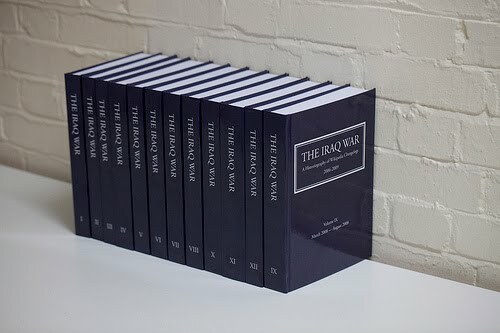 Suppose you cited the Wikipedia article on "The Iraq War," and someone who wanted to read further went to that article found noting more than "Saddam Hussein was a dickhead." The 1911 Britannica may not be up to date--but your reference to it will direct all readers to he same information.